As I have often claimed: Every trip has a defining moment. For me, the definition probably came two months prior to the actual trip, while skiing in British Columbia. The knee-grinding turns I was having to accomplish in what is affectionately referred to as "Cascade Concrete" would result in my tearing the medial meniscus of my left knee. To make a long and painful story short, I would learn the results of an MRI less than two weeks before I was to leave on this backpack. The surgeon thought that I could do the trip if I could tolerate the "discomfort." (Physicians rarely like to use the word "pain.") Susie and I figured if we could dramatically lighten my load, and split the trip into two parts, we could see a good chunk of the area, and spend 5 of the 7 nights in the backcountry with our friends. As long as I could tolerate the discomfort. So an early Friday morning in late April found us tooling down US 287 south of Ennis, Montana, avoiding the canyon-choking potential accidents along US 191's Gallatin River run, north of Big Sky, on our way to Salt Lake City to meet up with friends flying in from Tennessee and Texas. 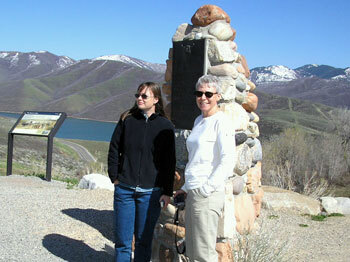 As Susie drove, I sat in the passenger seat, alternating looking for bald eagles and looking at the travel itinerary for the day. Gone were the days that I would collect everyone's Visa Card number, give them to our travel agent and put everyone from Knoxville on the same flight. Without me in town to ride herd, it was like the proverbial herd of cats getting to Salt Lake. Something like 6 different flight itineraries for 9 fliers. Different airlines, different schedules, lots of potential for problems. But amazingly, the first five people (Terri, Ray, John, Robin, and Barbara) all arrived on schedule. Cell phones aided in coordinating on the ground play on Friday afternoon. We managed to arrive in town about the same time Terri's flight was coming in, so we picked her up at the airport, and immediately headed for the Patagonia Outlet and the East side REI. We would meet the other four at one of our favorite feedbags in Salt Lake, the Café Pierpont. Later that night, while we all sat around in our complex of rooms, Will called and said he and Kim would be delayed getting in, due to thunderstorms in Dallas. It is always something. The next morning, Saturday, found many of us up early and eating waffles at the Days Inn, while Will and Kim took off for a jog. We moved the bulk of our gear out of our Highlander to the Ford Expedition that Ray rented, so we could pick up the last set of backpackers, Andy and Sue, flying in from Austin. The plan for the day was for everyone to meet up at the REI Coop in Sandy, and then head south to Boulder, Utah, where a 5:30 dinner reservation awaited us at the Hell's Backbone Grill. While we missed each other at various Sandy eateries, we did arrive a bit ahead of schedule in Boulder, which was fine. 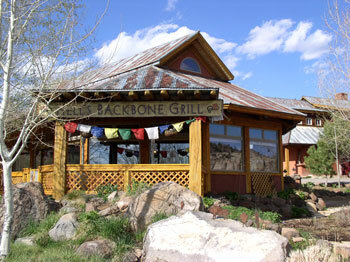 It is hard to describe the Hell's Backbone Grill, because it seems so out of place: here is a high end gourmet natural foods restaurant in a tiny (population 200 or so) town that is so remote that it was the last town in the lower 48 States to be connected to other towns by a road: in 1940. I must say: the service is super, the food even better, and it was a wonderful experience. They even let one bring in one's own wine bottle, which is a nice touch. Will joked, albeit accurately, that the corkage fee was more than I had paid for the wine. I reminded him that he had paid nothing for the wine, and that beggars should not be choosers. We had a terrific time. 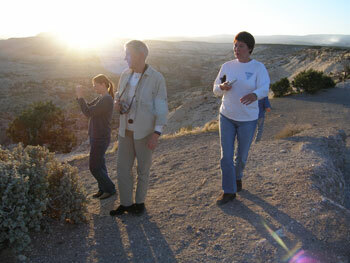 Then it was over to Escalante, and the Prospector Inn. The place seems to be the nicest, newest motel in town, even if the lady who runs the front desk seems to be in a perpetually sour mood. We unloaded our gear and split a bottle of wine with Sue and Andy, and drifted off to sleep. Only to worry, of course, if I could really do this trip, even in its truncated version. The furthest I had walked with the new pack on my back was a couple of miles, and we were scheduled to cover seven and a half the next day. Any potential success I would have to attribute to the remaining Cox-2 inhibitor on the market: Celebrex.